Streptomyces griseoflavus OC. 124-2 used in this study was isolated from the field soil of Dalaman Directorate of Agricultural Enterprises Muğla. As a result of phenotypic and molecular characterization, the isolate was identified as Streptomyces griseoflavus and named as OC. 124-2. The fermentation liquid of Streptomyces griseoflavus OC. 124-2 was obtained in optimum fermentation conditions, and then it was filtered and extracted with ethyl acetate 1:1. The extract containing the active compounds was obtained by evaporating the solvent. Biomonitor strains, Chromobacterium violaceum CV026 for the determination of anti-quorum sensing activity (anti-QS), Chromobacterium violaceum CV12472 for the determination of inhibition of violacein pigment production and Pseudomonas aeruginosa PA01 for the determination of anti-swarming activity were used at MIC and sub-MIC concentrations. The anti-quorum sensing and anti-swarming activities could not be detected for the extract. Violacein production was inhibited by 100%, 74.86%, 65.74% and 31.99% at MIC, MIC/2, MIC/4 and MIC/8 concentrations of the extract treatment, respectively. While the detected inhibition of violacein pigment production did not inhibit the bacterial growth, it was revealed that it inhibited the quorum-sensing-regulated signaling systems. Accordingly, it was shown that the active compounds obtained from ethyl acetate extract of OC. 124-2 constituted a non-selective pressure for the growth of drug resistant pathogen bacteria and they may be used as an alternative at treatment of these bacteria. ISNAD Akdamar, Gultekin , Ceylan, Ozgur , Ugur, Aysel . "THE QUORUM SENSİNG INHIBITION ACTIVITY OF THE ETHYL ACETATE EXTRACT OF STREPTOMYCES GRİSEOFLAVUS OC. 124-2". 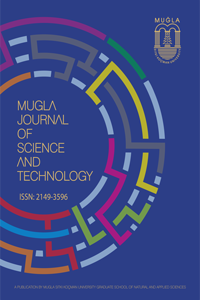 Mugla Journal of Science and Technology / (May 2016): 7-10.